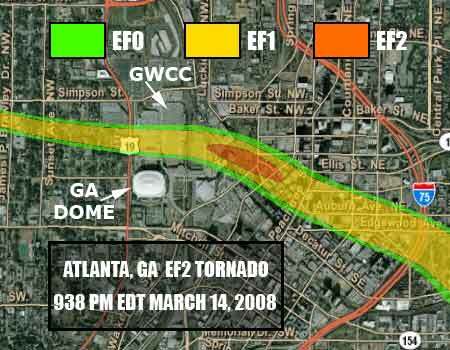 In the evening of March 14, 2008, the Georgia World Congress Center where the 90th Annual Meeting of the AMS is taking place this year was hit by an EF2 tornado. The supercell thunderstorm that produced the tornado was unexpected that day, with an outbreak of tornadoes forecast for, and subsequently realized, the next day. The adjacent Omni Hotel as well as CNN Center and a number of nearby hotels and buildings suffered significant damage in the tornado. CNN Center alone lost more than 1600 windows, and windows are still missing in the tube-shaped Westin Peachtree Plaza tower. While this tornado event won’t be presented as part of Impacts: Weather 2009 at the 2010 AMS Annual Meeting, a presentation during this Tuesday session will look at Tornado Effects on a Rural Hospital: Impacts of an EF-3 Tornado that struck Americus, Georgia in March 2007 (2:00 PM, January 19, 2010, B206). 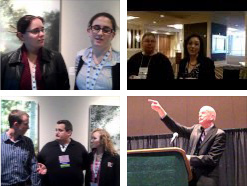 A presentation Wednesday morning (9:15 AM, B217) will look at lightning characteristics of the Georgia tornado outbreak the day after the 2008 Atlanta tornado. Its author commented that lightning characteristics of the tornadic storm that struck Atlanta the previous day might also be presented, if time allows. Also, a poster to be presented Monday will investigate the relationship, if any, between Southeastern tornadoes and drought. A climatological analysis of antecedent drought and spring tornadic activity will be available for viewing during the poster session Observed and Projected Climate Change from 2:30 – 4:00 PM Monday, January 18. We will be presenting a paper on the lightning associated with the the tornado event of the next day, March 15 2008. Primary emphasis will be on tracking the cells associated with the March 15th tornadoes, but a summary of the lightning characteristics on March 14th will also be presented if time allows.